"This casserole is perfect comfort food for the day after a holiday when you have leftover ham but don't feel like cooking! This is great served with broccoli, asparagus or a salad!" Preheat an oven to 375 degrees F (190 degrees C). Lightly grease a 9x13 inch baking dish. Combine the cream of mushroom soup, white wine, and water in a large bowl. 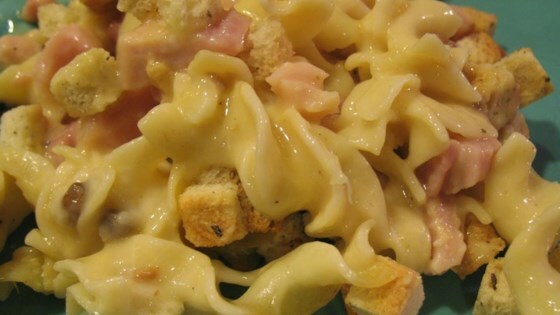 Stir in the cooked egg noodles, ham, and Swiss cheese. Pour the mixture into the prepared baking dish. Sprinkle the dry stuffing mix over the dish. Bake uncovered until the casserole is bubbling and browned, about 30 minutes. I added a 1/2 cup of sour cream instead of wine and it was perfect.